Kurio Kids Tablet was launched almost a year ago, but still a favorite tablet for children. The attraction lies in the design of protective Kurio brightly colored with a few options. By using protection, the Kurio tablet will be safe if it falls to the floor or hit the wall. Protector is designed serrated, in addition to easy to be grasped by kids also feel comfortable. If not needed, the protector can be removed and the tablet will look like a normal tablet. Protector with different colors to make kids freely choose the preferred color. Kurio launched and sold in July 2012 in the UK with Android platform 4.0 or Ice Cream Sandwich. Parents can download the application needed by their children from Google Play Store. Kurio produced three sizes of 7 inches (800 x 480 pixels), 8 inches (800 x 600 pixels) and 9 inches (940 x 500 pixels) with display capacitive touchscreen. To protect kids from entering adult sites, Kurio Tablet has a safety system to manage web that is accessible and should not be accessed by kids. In addition, Kurio also has a feature to limit the time of tablet usage by kids. Protective features could also be used to set the 8 user profiles, so that the tablet can only be used by multiple users who are reliable, so as not to adversely affect the kid as the primary user. In addition to the features to protect kids, Kurio kids tablet also features equivalent tablet for adults. Kurio Kids Tablet equipped with a storage capacity of 4GB, if still less can be added by using the Micro SD slot that has been provided. To Kurio 8 inch and 9 inch also comes with a 2 megapixel main camera on the back, and there are 0.3 MP front camera. As for the 7 inch screen is only equipped with a 0.3 MP camera. For connection, Kurio kids tablet supports HDMI and USB plugs. The capacity of the battery is claimed to last up to six hours. Kurio with a screen size of 7 inches priced at 233 USD, 280 USD for 8 inch and 311 USD for 9-inch. It's true that computer is used for kid's knowledge improvement. I want to take the design of computer with advantage for kids so please suggest me. If you really want to take the design of 7" Computer with great advantage then just focus on that. My youngest son had the kurio until he threw it down the stairs. For a very similar price, I got an acer tablet with a child protection cover and installed child safety lock. I love the kurio kids tablet but the setup I have now is better since my husband and I can use it as well. 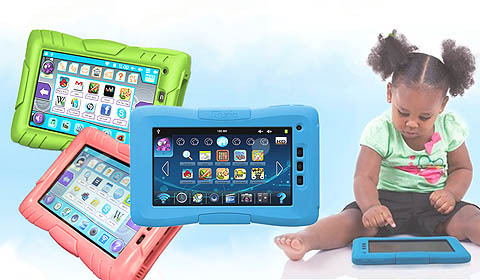 Wow, thank you for introduction, educational toys like a good kid tablet is important to kids. When choosing kid tablets, don’t be cheated by the beautiful design and it function configuration. Instead, the most concern that you should pay attention to is the inside content they designed for the kids. How about the content quality. Are they scraped together randomly or are they designed systematically and scientifically. This is the most important thing that we should concern. I have seen good Kids Learning Pad, I hope it will help some kids. Please where can I get these tablets for kids online? This website is remarkable information and facts it's really excellent. Thank you for sharing.